Dr. Van Tuerenhout joined the Museum staff full-time in 1999. Dirk Van Tuerenhout, Ph.D., Curator of Anthropology Dr. Van Tuerenhout is an expert in human cultures, especially those of Latin America, and is well versed in archaeology and anthropology. He took part in excavations of Late Roman ruins in his native Belgium, and Maya ruins in Belize and Guatemala. As Curator of Anthropology, he helped put together Lucy’s Legacy: The Hidden Treasures of Ethiopia, a world premier exhibit in which the actual skeletal remains of an early hominid, known as Lucy, were displayed. This exhibit, organized at the request of the government of the Federal Democratic Republic of Ethiopia, reviewed more than 5 million years of Ethiopian history and prehistory. As a Maya archaeologist, he was particularly keen on organizing an exhibit on the Maya in 2012. Maya 2012 served to introduce Maya culture – past and present – to the general public. This exhibit, organized with the participation of the Museo Nacional de Arqueología y Etnología of Guatemala, as well as the Library of Congress, Tulane University and other lenders, was well attended. This included a very large crowd of more than 4500 people who helped celebrate December 21, 2012, a day erroneously identified as the end of the world. 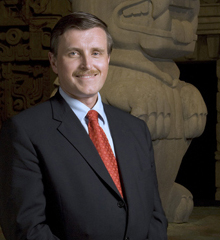 He also takes care of the John P. McGovern Hall of the Americas, which showcases the Museum’s permanent collection of artifacts from the indigenous cultures of North and South America, and (together with Tom Hardwick) of the recently opened Hall of Ancient Egypt. Together with Adam Mekler he co- curated Vanishing Worlds: Art and Ritual in Amazonia, a traveling exhibition of the world’s finest Amazonian feather art. Dr. Van Tuerenhout regularly serves as curator of traveling exhibitions such as The Dead Sea Scrolls (2004), Mummy: The Inside Story (2005) and Imperial Rome (2007), Secrets of the Silk Road (2010), The Cave Paintings of Lascaux and Magna Carta (2014). Dr. Van Tuerenhout has a Masters degree in Ancient History and another in Art History and Archaeology, both from the Katholieke Universiteit Leuven, Belgium, as well as a Masters degree and a Ph.D. in Anthropology from Tulane University. He authored a book on the Aztecs, and he speaks five languages, including English, Spanish, Dutch, French and German. Interested in careers in anthropology? View a list of useful websites, types of careers in anthropology, and tips prepared by Dr. Van Tuerenhout.